Our very own Bonang Matheba was the lead moderator at the United Nation (UN) General Assembly "Leave No Girl Behind" discussion in New York on Tuesday. The event aimed to accelerate action on girls’ education while ensuring that girls who are currently in school are able to master the basics and progress through secondary education. The esteemed group of panelists included the President of France, Emmanuel Macron, Canadian Prime Minister (PM) Justin Trudeau, British PM Theresa May and Norwegian PM Erna Solberg. The discussion on Girls Education and Empowerment – titled “12 Years to Break Barriers and Leave No Girl Behind” covered ways of achieving quality education for all girls globally by 2030 and also included a number of respected professionals in the field as well as advocates from Global Citizen who arranged the panel discussion. 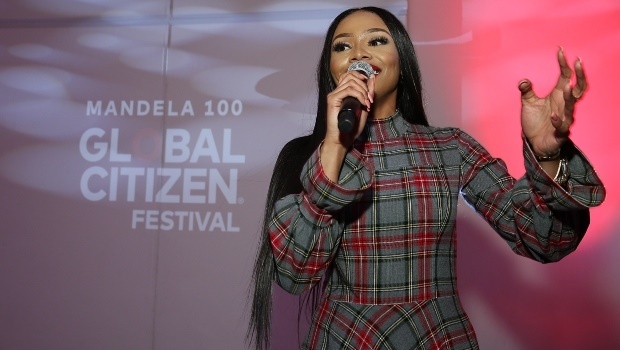 Bonang had this to say on Twitter about the importance of the discussion, “I believe that when you educate a girl child, you actually educate a community and you educate a family. As girls tend to become the head of the household, these young ladies pay their education forward; and an education is something that nobody can take away from you. It has a generational advantage and value,". The right to education is something that is often taken for granted, yet millions of people across the world are denied this human right due to social and economic limitations beyond their control. In particular, this has been the tragic reality for women and girls. The African continent has the highest adolescent pregnancy rates in the world, according to UNESCO. Every year, thousands of girls become pregnant at the time when they should be learning history, algebra, and life skills. Adolescent girls who have early and unintended pregnancies face many social and financial barriers to continuing with formal education. Girls are also more likely to never enter primary school than boys. Less than 40% of countries provide girls and boys with equal access to education. Only 39% of countries have equal proportions of boys and girls enrolled in secondary education. It is with these shocking statistics that we look to the UN and governments across the globe to make strides for change. Governments everywhere must do far more for girls’ right to education, to strengthen girls’ capacities and to create conditions for the fulfillment of their aspirations. This requires stronger legalisation and policies of protection and inclusion. Investing in girls and women's education should be a priority in order to to get rid of the historical gender gap in formal knowledge and skills acquisition. Equality will only exist when men and women have both have access to quality education and resources. We are hopeful that the discussion on girls' education and empowerment made progress in uncovering ways of achieving quality education for all girls and women globally by 2030. WATCH: Can paying girls to go to school help South Sudan? Duckie Thot, new face of L'Oreal Paris - "I’m looking forward to helping more girls love the beauty of their dark skin"